I seem to be on a roll this week in the shopping department! Yesterday I started my day with a trip to Target...one of my favorite places on this plantet by the way...and came out with $39 worth of groceries for $14.06! Did you know you can go onto Targets website...print their grocery coupons and then combine them with manufacturer's coupons?? If you didn't, I am hear to tell you...yes you can! I only bought what I had coupons for, but they were items I usually buy each week anyway. But that is truly another post. I could write a book on the whole coupon thing. I love the game of saving a buck. Speaking of saving a buck...I love decorating my house...and don't mind admitting I am totally cheap about it, too! After Target I paid a visit to a couple of the thrift stores I missed the other day. Tuesday is half-off day at a couple of my favorites...so of course I was there when the doors opened! Here is what I found...I hate it that I can't make my pictures larger, so click on them if you want to get up-close-and-personal. You may remember me talking about the wire baskets in Monday's post. The one where the owner thinks I am some poor stupid girl that can only afford or want the cheap junk the store doesn't see as 'valuable'. Fine by me...and I am not about to tell him there are a whole bunch of us that actually love it! After I made my purchase, I had to ask him about these wire baskets I saw sitting in a curtained-off area. (A tip from me to you...ALWAYS peek in the area behind a curtain. That is where they keep the new stuff!) He said they were not worth making a tag for...and that I could have them! Thank you Mr. Rather Condescending...I will take you up on that! This one is going in my new studio work space. I think it will be perfect for rolls of vintage wallpaper! And these I have a very special project for. They will be going in my office...in the Pottery-Barn-inspired desk my hubby just built for me! I am supposed to be painting it right now...I can't wait to show you as soon as I get it in place. Hopefully next week. 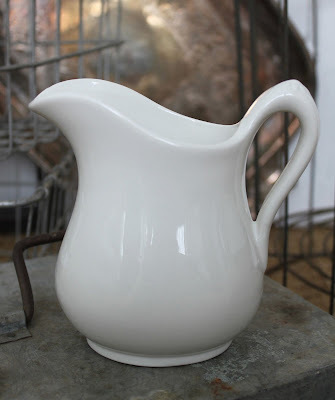 I can never have enough white ironstone pitchers. I have too many already...but I spread them all over the house and love each and every one of them! I need to find my local chapter of Books Anonymous. They are something I just can't resist. I try to stick to titles that fit things we love or are just the right color. The two tan books drew me in because of the color...and they fact that they are from a series about dogs was a bonus. I have never met a dog a didn't like. I love them all. And the On the Beach could not have been a more appropriate find. I have a lot of "beach" in our house. The bottom book was simply gorgeous. Who knows...this one I may put on etsy...but the graphics were just so gorgeous I could not pass it up! Just look at that cover! My husband swears I have a built-in radar for galvanized metal. I have picked up every old piece that has crossed my path for the last 10 years! It takes the number 2 spot on my "please bury me with this list"...right after my white ironstone. This beauty is going in my office. I love pretty-yet-a-little-crusty storage. Oh, and I can't forget my shell-motif antique picture frame...and a sugar mold candle holder for a buck! I'm off to paint the desk I told you about...I better get to work! I have had too much fun shopping, I'm not getting anything done! Here is my inspiration photo...lets hope mine is just as cute when I get it finished! You're definitely a pro! I adore your freebie wrapping paper basket! And I'm the same exact way about galvanized. Not sure what it is about it...but I find it super swoony! I love those baskets! Jealous of all your gorgeous finds! Girl you are on a roll, love the baskets, i have so many it is a real sickness I think and the galvanized box...made me purrr! Can't wait to see your photos of your new desk! Love...love...love all of you treasures! I adore wire baskets...can't get enough! Wonderful! Oh - I'm dying over here. I have such a deep love for any kind of metal & you hit the jack pot! Plus those books - I too love old books - I even have a small dog collection! I'm envious - and I badly want to run out of my office and over to Catholic Charities now! 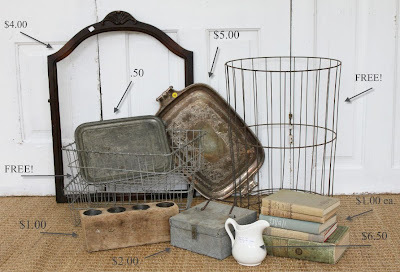 Love your finds... and that wire basket will be perfect for vintage rolls of wallpaper! mary, mary, mary! my goodness! you have some awesome thrift stores in your neck of the woods! i wish i could go shopping with you! what beatiful deals! I need to go on a thrifting trip with you. I love everything you found. The free baskets are awesome! And the books are beautiful!! What a perfect day, Target and great finds! Thanks for the Target tip, I am there at least 3 times a week and had no idea! What great treasures, there aren't many things better than ironstone pitchers and wire baskets! Sending some aussie sunshine yourway. Wow I just found you and it's a good thing we don't go shopping together because we would totally "fight" over the finds! LOL I love me a bargain too! I post stuff that I get for bargains too on my blog! Love the amounts and arrows thingy-hmm need to figure that one out! I just recently bought an old wooden banker's chair on craigslist for $15 and will be putting on new casters and painting it white to go into my office! p.s. your photos are fabulous too! Oh, you're killing me! Seriously. Judging by your keen eye and recent scores -- you're office is going to look even better than the inspiration photo. Now quit robbing the thrift stores of the world of all of their treasures! those baskets are my favorites!! Sweet! Did you know that you can use expired coupons at Target too? My favorite protein bars sometimes come with $1.00 off coupons in their boxes. The thing is...the most recent bars I bought don't expire until next winter...but the coupons expired last month. I used two of em' on Saturday. i've been going through pages and pages of your blog and i just love it! you find the most amazing things! i must admit i'm a little envious, i never seem to find that kind of stuff here in california (or if i do it's WAY over priced). i'm drooling over all of your finds though. i loved reading about the WW II letters you found. amazing!! !